A la mer ou conseils pour la santé. Avec quatre vues photographiées. Paris : Librairie internationale, . Description : [2 l.], -370 p., [4 l. pl. ], [1 l.] errata ; ill.: 4 phots., tabs. ; 22.5 cm. Photographs : 4 mounted albumens of views. Subject : Body — Health ; Health resorts. Author caption: PAR LE DOCTEUR BURGGRAEVE | PROFESSOR A LA FACULTÉ DE MÉDECINE DE L'UNIVERSITÉ DE GAND. Professor Emeritus at Ghent University. Chief surgeon at the Ghent City Hospital. Inventor of the dosimetric system of medicine. Rare — 1 copy found at Bibliothèque Universitaire Santé Lyon. Et qui sait? Nos administrations de bienfaisance voudront peut-être faire partager aux enfants du pauvre, à ces orphelins parqués aujourd'hui dans l'air malsain des villes, les bienfaits réservés jusqu'ici aux enfants des classes aisées. Alors on verra disparaître ou diminuer, dans les classes laborieuses, ces vices de constitution, ces scrofules, ces rachitismes qui sont la honte de notre civilisation. Alors reparaîtra ce beau sang dont nos ancêtres étaient si fiers et dont les habitants du littoral maritime semblent avoir conservé le dépôt. Dr BURGGRAEVE 1er juillet 1864. The medical historian would be well advised to approach the legacy of Burggraeve — the Belgium Hippocrates — with an appreciation for its complexity. On the one hand, Burggraeve was a pitchman of vogue medicine, the architect of a pharmaceutical empire based on the questionable science of what he called la médecine dosimétrique, but on the other hand, the Burggraeve system effectively jugulated the quack practitioners of much more dangerous drug regimens. He made no important advancements in medical science that are visible today, and yet the man should be read and respected for the depth of his scholarship, for his many thoughtful writings on public hygiene and for his wonderful biographies of Jenner and Vesalius. 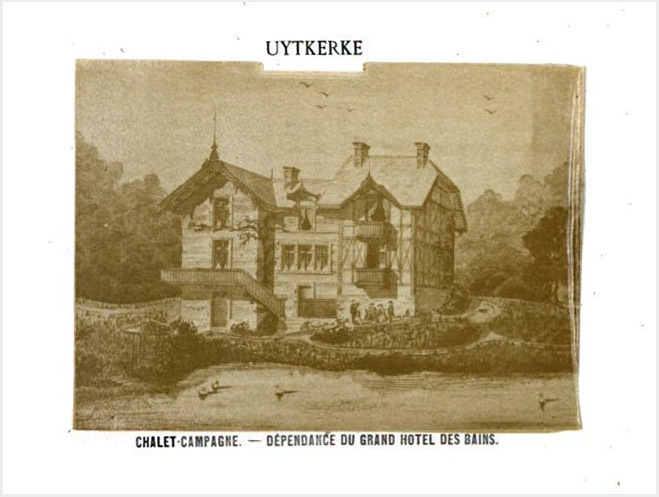 This sweet little book advocates the health benefits of seaside resorts and is illustrated by four albumens representing views of coastal resorts in the West Flanders region of Belgium, including two views of grand hotels in Blankenberghe and one albumen reproducing a drawing of a resort in nearby Uytkerke. It is beautifully written, but the science is only borrowed, mostly from the German naturalist, Alexander von Humboldt (1769-1859), who directed scientific expeditions to map the Earth's climate and to test the ocean waters. It is difficult to shake the impression that the book is little more than a promotion for these commercial enterprises and the reader will marvel at the exquisitely turned entrepreneurship hidden within the Burggraeve genre.